WIND CAVE, S. DAK., August 7, 1915. 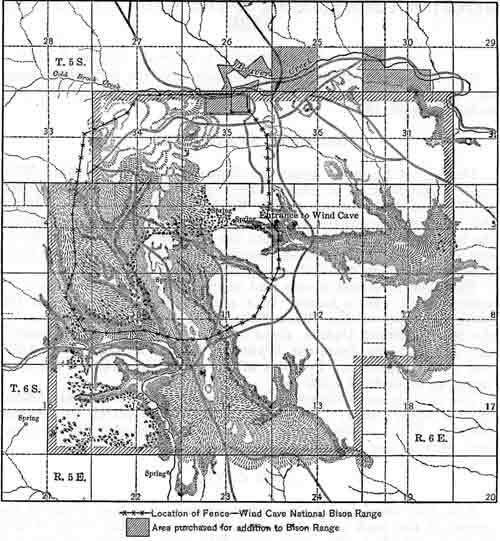 The act of Congress approved January 9, 1903 (32 Stat., 765), made reservation of a tract of land in South Dakota, comprising 10,522 acres, to be known as the Wind Cave National Park. When this act was passed there were several tracts of patented lands within the boundary, but the Government has secured title to all such lands, and at the present date the boundaries of the park embrace no lands that are not under the exclusive control of the Government. The park is almost square and has an area of approximately 16 square miles. It is located in a semimountainous region on the southern slopes of the Black Hills, in the southwestern corner of the State of South Dakota, about 36 miles from the southern boundary and 24 miles from the Wyoming line. The altitude is 4,030 feet at headquarters. Portions of the mountains west of the cave attain an altitude of 4,700 feet. The park is under direct control of a supervisorthe only official upon a regular salary. One or two guides serve during the summer months. There is also a park ranger for a month at a time to assist with grazing and timber matters. 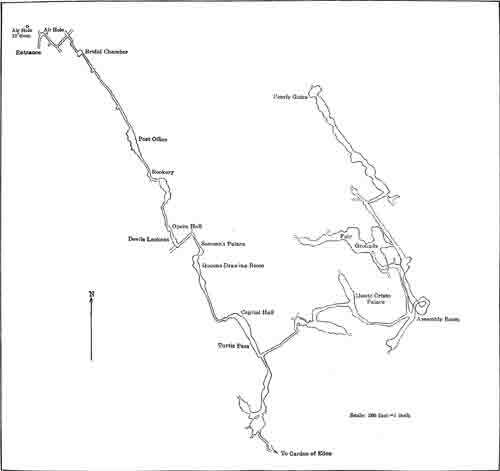 The chief attraction is the cave, situated somewhat north of the center of the park and about 12 miles north of the town of Hot Springs, which is the most accessible town of any importance. Headquarters for the park is maintained in close vicinity to the cave. Both the Burlington and the Chicago & North Western have regular train service with east and west connections to Hot Springs, and the majority of the visitors to the park come from this town. Mail and express matter comes to the park by way of Hot Springs. The cave has been made accessible to the public by the working out of the passageways so as to admit of easy travel. It has also been necessary to construct a number of stairways, landings, bridges, and railings within the interior. The lower levels to which the public is conducted are possibly 480 feet below the surface entrance, and the total approximate linear distance of all accessible routes is not over 3 miles. There is a spring and miniature lake in one place, and aside from this the cave is without water or moisture, except from condensation of a heavily laden air. In this way moisture gathers on the ceilings of some caverns and drops to the floors, causing wet spots, but in very few places. The predominating formations are of limestone, and visitors derive considerable satisfaction from viewing the calcite crystals, exposed geodes, box-work forms, and innumerable other beautiful formations. The building for the use of the public as a waiting and registration building has been completed. Repairing of stairways within the cave and the building of new stairs and landings where necessary. Building of an ice house, size 12 by 12 feet, 10 feet high. Five miles of road was reshaped and smoothed, about one-half mile of which was made new in the process of straightening. An underground reservoir of masonry 1 foot thick, with capacity of 450 barrels, was built and connected to a new sanitary drinking fountain near public building and the former hydrants and outlets in yard and residence. None but galvanized pipe was used in this system, and all conductor pipe was placed to a depth of 4 feet. The pipe is gradually reduced from 2 inches at outlet of reservoir to three-fourths inch at hydrants. The new reservoir is located 70 feet above and 300 feet distant from the park residence. Screen doors and windows have been put on the public building and board fence adjoining same has been painted to conform with the color of the building. The water pipe which was laid from the yard of the residence to pasture across road last year became clogged through freezing and burst, and was taken up. I considered it impracticable to use half-inch pipe and have substituted therefor some eave trough and spouting which was here, to conduct the waste water from drinking fountain to trough in pasture during the summer months. The supervisor's office and all the rest of the rooms of the residence have been painted and porch and window screen repaired and painted. Various other work of minor importance has been performed. The buildings are in a good state of repair except the supervisor's residence, the upstairs portion of which is still unfinished. It contains six rooms and is substantially constructed of stone obtained from within the park. One building for registration and use of public visitors, containing three rooms. One small, rectangular, open pavilion to provide shade was built expressly for the use of tourists who come from long distances and who necessarily have to stop at headquarters and lunch in order to take time to see the cave. A small frame house over the entrance to the cave. A good barn, with room for 5 head of horses, hay loft, and carriage room. A small log tool house and blacksmith shop combined. An ice house, size 12 by 12 by 10 feet. The pavilion, public building, and ice house are new; the supervisor's residence and barn are but a few years old, and all are in good condition. The source of water supply is a spring about one-half mile west of and 150 feet higher than the park residence. The old pipe line from the spring to the new reservoir is still used. It is of three-fourth-inch galvanized pipe, and unless too near the surface in some places to afford protection from frost in winter will suffice for some years. The capacity of spring is now about 40 barrels a day, though after a long period of excessively dry weather it has run as low as 4 barrels a day, the least it has been known to produce since its discovery. Having repaired the old tank, which holds 350 barrels, and connected same to new system, we now have storage for about 800 barrels of water, which, with the varying capacity of the spring, assures the park ample for all needs and a reasonable degree of protection from fire for the buildings. There is but one main road through the park, extending from the north to the south, about through the center and passing headquarters. From the regions south and east this is the route to all of the Black Hills country and to much country in Wyoming and Montana. This road is of dirt and was before the heavy rains in June the best stretch of road between Custer and Hot Springs, but is at present in need of repair, which is now being done. The road both north and south of park limits has recently been greatly improved for a distance of 20 miles either way, and the increase of automobile travel as a result is very marked. The traffic is mostly by automobile and is increasing rapidly. Many parties that go through are bound for the many places of interest in the mountain regions to the north and have camp equipage packed in their cars. In addition to this through automobile traffic, visitors to the cave are brought to the park from Hot Springs principally by automobile. Owners of cars desiring to bring visitors to the cave are required to take out a license for that purpose. At present nine automobiles are in use for that purpose. The spring and summer season has been so cold and the weather so excessively rainy that so far this year there has been a much lighter attendance to the cave and the Hot Springs resort than usual. For the year ended June 30, 1915, the total number of registered visitors to the cave was 2,817. Of these 2,060 came during the three summer monthsJuly and August of 1914 and June of 1915. It is the custom for an authorized guide (or guides) to conduct these visitors through the cave during these summer months, and as a trip therein requires about three hours but two trips each day are undertaken. The established time for entrance to the cave is at 9 o'clock in the morning and 2 o'clock in the afternoon. Each visitor pays a fee of 50 cents for entrance, and these fees are remitted to the department, the guides being upon a salary basis during the months of most attendance. Many camping parties pass through the park with team and wagon, but on account of the lack of running water and scarcity of dead wood these people stop along the northern boundary and are not strictly within the park. It has been the custom not to encourage this class of traffic to stay longer than necessary, on account of the danger of fires. There is no record of campers who have stayed within the park over 24 hours. The ordinary summer season is hot and dry, with much wind, and the danger from disastrous fires is very great. The movement of loose stock along the main road is not great. During the past year there has been but a few odd head of cattle taken through the park on the road. This stock belonged to local ranchmen who were changing their cattle from one range to an other. Considerable stock is driven about the park, but on cross-country trips, without regard to the road. The western half of the park is covered with pine timber. The ordinary longleaf pine predominates, with some lodgepole pine interspersed. Some of this timber is approaching a size to be of commercial value. The timbered area of the park will stand for some forestry application and is worthy of more than passing notice. There is a running stream which skirts the northern boundary of the park for a distance of about a half mile, but in very dry seasons it ceases to flow. There is no other running stream within the park. For the establishment of a national game preserve, to be known as the Wind Cave National Game Preserve, upon the land embraced within the boundaries of the Wind Cave National Park, in the State of South Dakota, for a permanent national range for a herd of buffalo to be presented to the United States by the American Bison Society, and for such other native American game animals as may be placed therein. The Secretary of Agriculture Is authorized to acquire by purchase or condemnation such adjacent lands as may be necessary for the purpose of assuring an adequate, permanent water supply, and to enclose the said game preserve with a good and substantial fence and to erect thereon all necessary sheds and buildings for the proper care and maintenance of the said animals, $26,000, to be available until expended. The establishment on this preserve of herds of bison, elk, and antelope has resulted in an added interest by the public in this park. It is particularly adapted to this purpose and the animals are doing well. The inclosure is about the western portion of the park and creates a pasture of about 4,000 acres. Since it is impossible at times for the general public to obtain a glimpse of the game animals within this large pasture, there is a clamor for a smaller inclosure alongside the road, near the park headquarters, where some of the animals may be kept so visitors to the park can see them. The herds at present number 16 buffalo, 16 elk, and 11 antelope. As a natural game reserve there is but the one animal, the white tail deer, that has come under the protection of the park. These are present in small numbers throughout the season, with more in the autumn season on account of the hunting, to the northward, which drives them to the park for refuge. The prairie sharp-tailed grouse and the bobwhite are present within the park in small numbers, and both are increasing and doing well. With the proper protection of these birds, which they are now getting, their rapid increase is assured. The magpie, a most beautiful bird itself, is by far the worst enemy to bird propagation within the park. The magpie is migratory and is with us from late winter till July or until their young can fly well. While here they prey upon the young and eggs of other birds. This nuisance should be exterminated. Coyotes and bobcats are common and an occasional gray wolf has been seen. The worst local enemy to pine timber is the otherwise inoffensive porcupine, whose destructive work is evident here and there in the wooded area of the park. List Of yearly permits authorized for transportation of passengers by automobile, Jan. 1, 1915, to Dec. 31, 1915, in the Wind Cave National Park. Permits issued for the grazing of horses and cattle, using such of the park lands as are designated by the superintendent thereof. No. Name of permittee and rate exacted per head on horses and cattle. Number grazed. I submit for your consideration the following recommendations. Charging of a license fee for the transportation of passengers to the cave should be abolished, as I think it would net a gain to the park revenues, reduce the expense to visitors, and be much more satisfactory to the public in general. Almost without exception visitors to the cave assert that it ought to be lighted by electricity throughout, and many rail at our primitive system of lighting parties through. I recommend that $3,000 be provided for the installation of electric lights throughout the interior of the cave. Two miles of game fence, inclosing about 300 acres from within present buffalo pasture and adjoining park headquarters, enabling visitors to the cave to see specimens of the game inclosed therein, should be built. This would also contain park spring, water supply, and storage tanks, and be amply large to maintain 25 animals the year round. I estimate the cost of such fence to be $1,500. I recommend the building of 1 mile of permanent road within the park and properly shaping and macadamizing same for a width of 12 feet; other road and bridge work, lowering grades, and repair and upkeep of park roads in general. The former I estimate at $1,000, the latter at $700. Lowering of pipe from spring to reservoir to insure against freezing and bursting; extension of pipe line from hydrant in road to barnthe two to cost about $300. Constructing neat fence on north and south sides of yard, connecting game fence at rear to stone fence in front of house; requiring 22 rods, estimated cost $75. Covering part of yard with coat of fertile soil 3 inches deep, to make possible a lawn; cost for labor about $100. Partitioning and finishing of upstairs portion of park residence, making into three rooms and bathroom, toilet, and lavatory; estimated cost about $460. Repair and improvement in the cave, putting in new stairs, bridges, ladders, and safeguards as old ones decay; about $150. General repairs to buildings and grounds that unforeseen necessities for expenditure arise from require $100. Repairing the pasture fence, rebuilding 1-3/4 miles of fence, requiring 450 new posts (using all old wire), $125. Painting the barn, $35; telephone service for supervisor's office, $40; fuel for supervisor's office and public building, amounting to $50 for cutting and hauling wood for both stoves. The supervisor's salary is insufficient for maintenance and should be adjusted to $1,500. There should be an allowance of $1 per day to the supervisor for expense of keeping horse for range service, $365. I recommend the employment of one park ranger for guide and general service, July 1 to September 15 and May 1 to June 30, at $90 a month, and a second ranger from July 1 to September 15 and during the last half of June (three months), at $75 a month. First ranger's total salary, $405; second's, $225. This park's share of expenses, salaries, etc., department representatives, general superintendent of national parks and his assistant, as established, $300. GENERAL REGULATIONS OF MARCH 30, 1912. It is forbidden to remove or injure the specimens or formations in and around the Wind Cave, or to deface the same by written inscription or otherwise, or to injure or disturb in any manner or carry off any of the mineral deposits, specimens, natural curiosities, or wonders on the Government lands within the park. 2. No person shall be permitted to enter the cave unless accompanied by the supervisor or other park employee, or by competent guides. 3. It is forbidden to cut or injure any timber growing on the park lands or to deface or injure any Government property. Camping parties will be allowed to use dead or fallen timber for fuel. 4. Fires should be lighted only when necessary and completely extinguished when not longer required. The utmost care must be exercised at all times to avoid setting fire to the timber and grass. 5. Hunting or killing, wounding or capturing any bird or wild animal on the park lands, except dangerous animals when necessary to prevent them from destroying life or inflicting an injury, is prohibited. The outfits, including guns, traps, teams, horses, or means of transportation used by persons engaged in hunting, killing, trapping, ensnaring, or capturing such birds or wild animals, or in possession of game killed on the park lands under other circumstances than prescribed above, will be taken up by the supervisor and held subject to the order of the Secretary of the Interior, except in cases where it is shown by satisfactory evidence that the outfit is not the property of the person or persons violating this regulation and the actual owner thereof was not a party to such violation. Firearms will only be permitted in the park on written permission from the supervisor thereof. 6. Fishing in any other way than with hook and line is forbidden and may be prohibited by order of the supervisor in any of the waters of the park, or limited therein to any specified season of the year, until otherwise ordered by the Secretary of the Interior. Fishing for purposes of merchandise or profit is forbidden. All fish less than 8 inches in length should at once be returned to the water with the least damage possible to the fish. Fish that are to be retained must be at once killed by a blow on the back of the head or by thrusting a knife or other sharp instrument into the head. 7. No person will be permitted to reside permanently, engage in any business, or erect buildings, etc., upon the Government lands in the park without permission, in writing, from the Secretary of the Interior. The supervisor may grant authority to competent persons to act as guides and revoke the same in his discretion. No pack trains will be allowed in the park unless in charge of a duly registered guide. 8. Owners of patented lands within the park limits are entitled to the full use and enjoyment thereof; the boundaries of such lands, however, must be determined and marked and defined so that they may be readily distinguished from the park lands. While no limitations or conditions, are imposed upon the use of such private lands so long as such use does not interfere with or injure the park, private owners must provide against trespass by their stock or cattle, or otherwise, upon the park lands, and all trespasses committed will be punished to the full extent of the law. Stock may be taken over the park lands to patented private lands with the written permission and under the supervision of the supervisor, but such permission and supervision are not required when access to such private lands is had wholly over roads or lands not owned or controlled by the United States. 9. Allowing the running at large, herding, or grazing of cattle or stock of any kind on the Government lands in the park, as well as the driving of such stock or cattle over same, is strictly forbidden, except where authority therefor has been granted by the supervisor. All cattle or stock found trespassing on the park lands will be impounded and disposed of as directed in regulations approved March 30, 1912. 10. No drinking saloon or barroom will be permitted upon Government lands in the park. 11. Private notices or advertisements shall not be posted or displayed on the Government lands within the reservation, except such as may be necessary for the convenience and guidance of the public. 12. Persons who render themselves obnoxious by disorderly conduct or bad behavior, or who violate any of the foregoing rules, will be summarily removed from the park and will not be allowed to return without permission, in writing, from the Secretary of the Interior or the supervisor of the park. No lessee or licensee shall retain in his employ any person whose presence in the park shall be deemed and declared by the supervisor to be subversive of the good order and management of the reservation. 13. Any person who violates any of the foregoing regulations will be deemed guilty of a misdemeanor, and upon conviction be fined not more than $1,000, or be imprisoned not more than twelve months, or both, in the discretion of the court, as provided by the act creating the park. 14. The supervisor designated by the Secretary is hereby authorized and directed to remove all trespassers from the Government lands in the park and enforce these rules and regulations and all the provisions of the act of Congress aforesaid. REGULATIONS OF MARCH 30, 1912, GOVERNING THE IMPOUNDING AND DISPOSITION OF LOOSE LIVE STOCK. Horses, cattle, or other domestic live stock running at large or being herded or grazed on Government lands in the Wind Cave National Park without authority therefor will be taken up and impounded by the supervisor, who will at once give notice thereof to the owner, if known. If the owner is not known, notice of such impounding, giving a description of the animal or animals, with the brands thereon, will be posted in six public places inside the park and in two public places outside the park. Any owner of an animal thus impounded may at any time before the sale thereof reclaim the same upon proving ownership and paying the cost of notice and all expenses incident to the taking up and detention of such animal, including the cost of feeding and caring for the same. If any animal thus impounded shall not be reclaimed within thirty days from notice to the owner, or from the date of posting notices, it shall be sold at public auction at such time and place as may be fixed by the supervisor after ten days' notice, to be given by posting notices in six public places in the park and two public places outside the park, and by mailing to the owner, if known, a copy thereof. All money received from the sale of such animals and remaining after the payment of all expenses incident to the taking up, impounding, and selling thereof, shall be carefully retained by the supervisor in a separate fund for a period of six months, during which time the net proceeds from the sale of any animal may be claimed by and paid to the owner upon the presentation of satisfactory proof of ownership, and if not so claimed within six months from the date of sale such proceeds shall be turned into the Wind Cave National Park fund. The supervisor shall keep a record in which shall be set down a description of all animals impounded, giving the brands found on them, the date and locality of the taking up, the date of all notices and the manner in which they were given, the date of sale, the name and address of the purchaser, the amount for which each animal was sold and the cost incurred in connection therewith, and the disposition of the proceeds. The supervisor will, in each instance, make every reasonable effort to ascertain the owner of animals impounded and to give actual notice thereof to such owner.